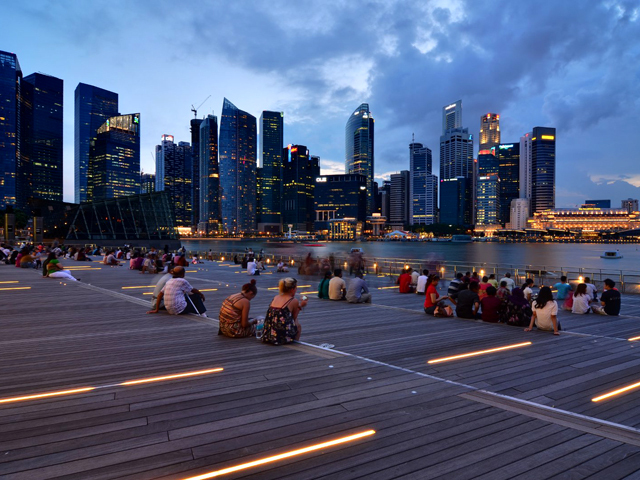 A crowd gathers overlooking Singapore’s Marina Bay. Since the inception of its 1971 Concept Plan, Singapore has become one of the most sustainability-oriented cities in the world. Photo by Nicolas Lannuzel/Flickr. This is the second entry in the Urbanism Hall of Fame series, exclusive to TheCityFix. This series is intended to inform people about the leading paradigms surrounding sustainable transport and urban planning and the thinkers behind them. By presenting their many stories, TheCityFix applauds these leaders’ efforts, and seeks to challenge our readers to think carefully about what defines leadership and innovation in sustainable transport and urban development. When looking at some of the great examples of sustainable transport and urban development, we must include the city-state of Singapore and the leadership of Lee Kwan Yew, its founder and Prime Minister for 31 years. Singapore is a young nation, founded only 48 years ago after being expelled by Malaysia. Yet, in such a short time, Lee Kwan Yew led the multicultural city from a chaotic and crime-ridden port in the Malacca Straits to a prosperous nation, providing a high standard of living through human-centered design and planning for its 5.3 million inhabitants. After working hard to gain independence from British rule, Singapore became a part of Malaysia in 1963, but the multiplicity of its different ethnicities and weak internal government made for a difficult relationship with the mainland, and it was soon expelled in 1965. Lee Kwan Yew was Singapore’s first Prime Minister, and charged ahead to create a strong country despite a lack of natural resources and small geographic area – Singapore is just 286 square miles. New York City, by comparison, is over 50% larger at 468 square miles. The first thing Lee Kwan Yew did was develop a cohesive, long-term urban plan. 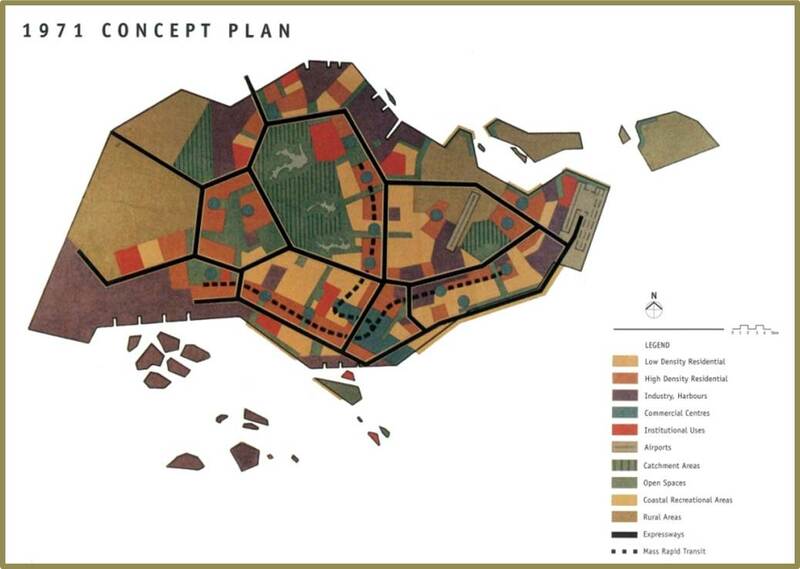 The plan organized the city into different districts, some with high density and others with large open spaces. The plan made sure to preserve the central water source, and revolved around a high capacity mass transit system to provide fast and reliable access around the island. New housing complexes were built to be mixed-use and accessible to mass transit, with an eye to the conservation of historic districts. The original plan developed in the 1970s has been revised every 10 years. These reviews have included integrating land use and transport planning through coordination among government agencies – such as the Ministry of Transport, Ministry of National Development, and Ministry of Trade and Industry, among others. The city-state also recruits top staff and has created strict regulations to avoid corruption, going beyond the master plan to build strong leadership in the public sector. Singapore’s 1971 Concept Plan. Source: Government of Singapore. Although the plan has changed over the years, it has retained its “people-centered” characteristics. This includes developing the city in a way that provides connections with others, opportunities for social interaction, access to numerous services, and an inclusive environment. These elements in the current plan (2013) translate to such concrete developments as building affordable homes, creating green spaces, enhancing mobility and transport connectivity, sustaining the vibrant economy with good jobs, and dedicating resources to the preservation of the environment. These developments were further complemented with congestion pricing and vehicle registration quotas. Singapore’s congestion pricing was first implemented in 1975, predating London’s congestion pricing scheme by some 28 years. The original congestion pricing scheme has evolved from a manual system to electronic collection, and now includes dynamic pricing. This means that when congestion increases, so does the cost. This keeps the freeways flowing smoothly at 35-65 km/h (21-38 mph) and other roads at 20-30 km/h (12-18 mph). Vehicle registration quotas on the other hand, were introduced in 1990 in a complementary effort to reduce the growth of automobile usage. Nowadays it is more expensive to have a license for a car in Singapore than to own a house in the United States. Revenues from both congestion pricing and vehicle registration quotas are used to improve, maintain and expand Singapore’s world class transit system, combining an extensive metro with high-quality buses and light rail infrastructure. Singapore is now ranked number three in GDP per Capita with 60,799 and number 18 in the UN Human Development Index. The country is considered the safest in the world, with 0.3 homicides per 100,000 people. In comparison, the United States had 4.3 homicides per 100,000 people in 2011. Singapore also ranks highly in road safety, with 4.46 fatalities per 100,000 people in 2010, a figure lower than Sweden (5.52). Apart from these impressive statistics, it has also created an enduring cultural image of itself as a City in a Garden. It has one of the most successful land transport and urban development, and is a poster child of transit-oriented development (TOD). Both as a city and a country, Singapore is a strong example of the potential to advance economic, social and environmental goals simultaneously. There are many actions still to be taken and controversy remains surrounding Lee Kwan Yew and his political approach. The city is in a way a victim of its own success, and affordability has been compromised. Singapore is also jokingly referred to as “The Fine City”, not because of its quality, but its high fines imposed on citizens for activities like jaywalking or chewing gum. But the future for the city-state is bold. The current metro network is 178 km (110 miles). The vision is to double this to 360 km (223 miles) by 2030, meaning 80% of households would be within a ten-minute walk of a railway station. At the same time, Singapore seeks to enhance its transit hubs, mixing uses with high density and smart design. The city-state also has plans to add bus exclusive lanes complemented by traffic signal priority, and electrify the vehicle fleet, including bus fleets and an extensive e-vehicle recharge network. For pedestrians and bikers, the city will extend sheltered walkways and shaded bikeways. All of these plans are aimed at achieving bold targets. Singapore aims to achieve 70% of trips by public transport by 2020, and provide 0.8 hectares of green park space for every 1,000 residents by 2030. The plan’s preparation includes an extensive consultation process to identify the needs and expectations of the people in the city, and with the constant inspiration of Lee Kwan Yew to build a city in a garden, or maybe one day, a city in a forest. Source: Urban Redevelopment Authority of Singapore.